If you love to fish with caddies fly imitations, it is very important to match the right moment for the use of this kind of dry fly. The right moment is, in contrast to the may flies, not during the hatch. Now the fish are more focused on the endless ascending pupae than on the adult animals that remain only for a brief time on the water surface, because they can fly soon - in contrast to the may flies that due to the long drying time of the wings are force to remain longer on the water surface. The right time for the application of a caddis fly pattern are the evening hours. The caddies flies that emerge during the day and are hunkered down in a save place on the river, copulate and move again on the water surface for the egg position! At this time an amount of caddies flies populate the air and the water surface. Now, in the evening, you will be very successful with our imitations. We stock about 90 different imitations of caddis flies in our assortment in order to cope with any situation. Caddies flies are also called sedge flies. 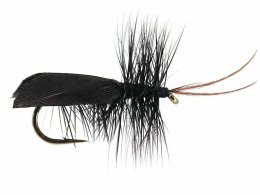 In this fly category you will find also different "Wulff" flies with good floating properties. Lee Wulff was a famous fly fisherman and fly tier of the '70s and '80s and is considered as one of the fathers of modern fly fishing.